The pre-neopostmodern electro-Amish man using sense and caution when voiding any warranty. A few years ago I had to make a fairly long road trip. Around 8 hours each way. I typically use my phone to provide music through the aux jack on my stereo, and when I travel to parts unknown I also use my phone for GPS navigation assistance. On this particular journey I had also planned to play with a new bluetooth gadget that I had just purchased. Obviously, a phone simultaneously running 3G, bluetooth, GPS, & playing music uses a lot more power than a sleeping phone running no services lying on the seat. I soon discovered that my off-the-shelf lighter-plug car charger would not provide sufficient current to keep up. Even when only using the GPS my phone’s battery was draining. After several purchases of progressively more expensive chargers I finally broke down and did some R&D. I’ve since built a multi-port linear supply from scratch into the dash of my truck, but my wife wanted a no-dash-cutting solution for her car. You may have noticed that your device charges faster when using a wall charger than when using a car charger. On some set-ups that charge through USB you may have also noticed that your device knows the difference. There may be a different icon displayed when charging with one than the other. The reason for this is that some devices can charge at different rates under different scenarios. I’m going to disclaim here for a second: I’m not responsible if you melt down, electrocute, or violently explode your very expensive device, your car, your home, or your dog. These are all very real possibilities if you misuse or make any alterations to electrical devices. 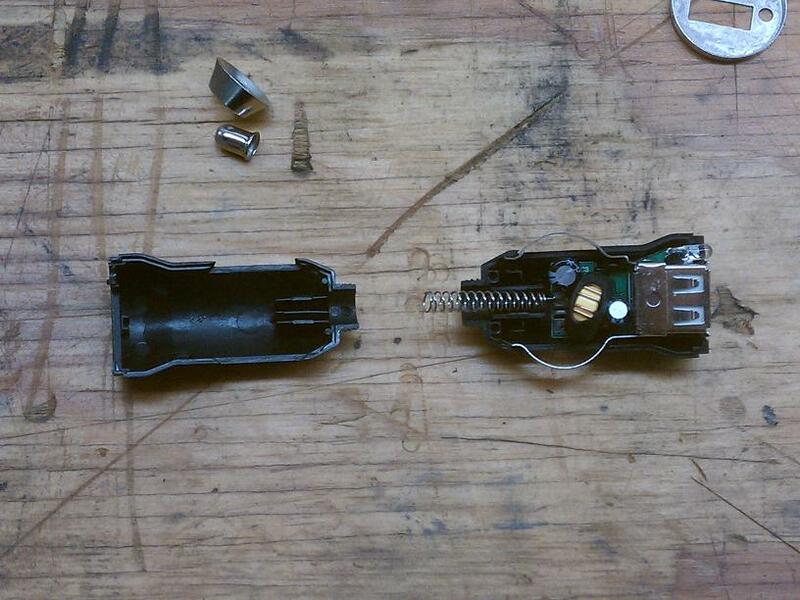 Use sense and caution when voiding any warranty. That being said, the method that devices use to determine when they can charge at a higher current is through the USB connection itself. A standard USB type-A connector uses 4 pins: The 2 outside pins are for supplying current and the 2 center pins are for data. If the center 2 data pins are shorted together then it is obvious that no data can flow. This is an indication to the device that it can charge at a faster rate. I’ve found a car charger that, once modified, happily provides me with enough current to run all of the services I want. It appears to be rebranded and sold by a number of different vendors and is readily-available for under $10 at just about every chain store and interstate truck stop I’ve visited since. Another advantage it has over some other chargers is that when it is installed it sits back flush enough to the receptacle to allow the ashtray door to close. 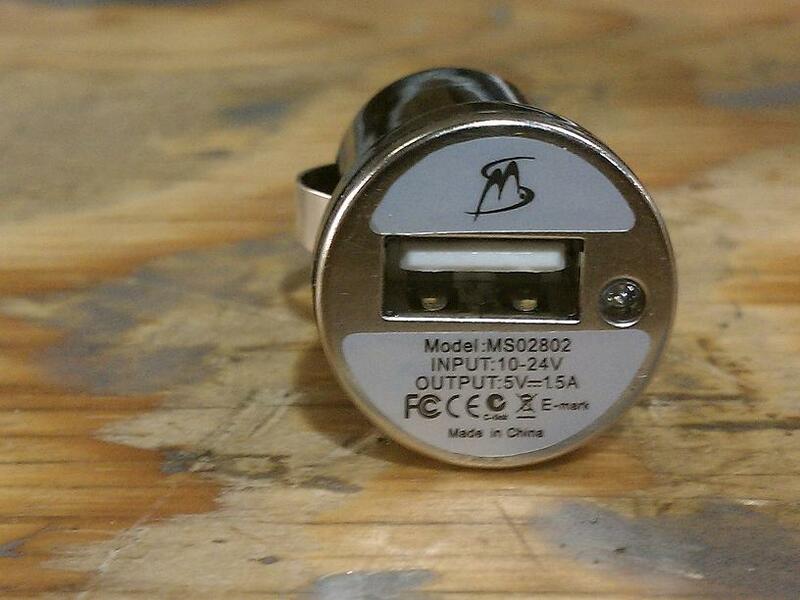 When selecting a charger to perform this mod on be mindful of the output current. The higher the better. In fact, you should be looking for something capable of providing around at least a full amp. That in and of itself won’t charge your device faster, however. You still have to alter the charger. 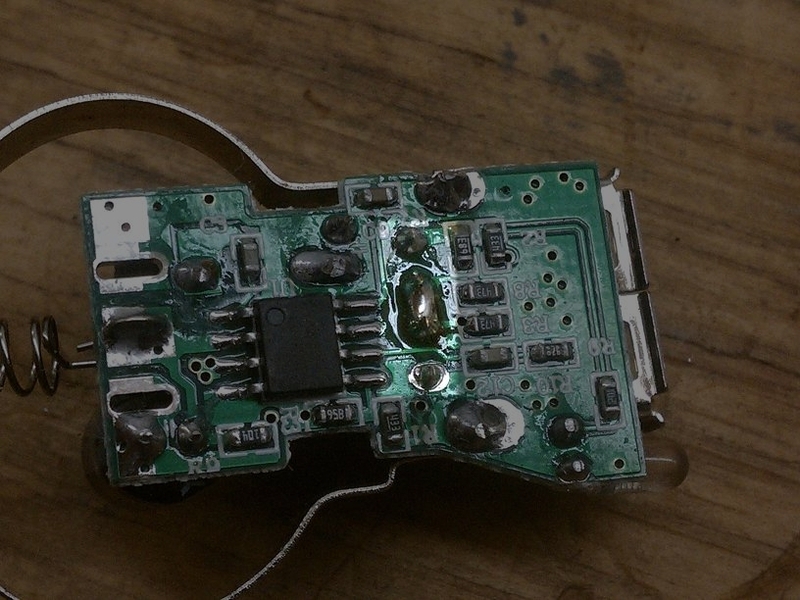 Once you have the charger in hand the mod is simply this: open it up, connect the center 2 solder pins of the USB connector together, and put it back together. Opening the charger up is as simple as removing a single tiny screw, unscrewing the contact at the back, and popping it apart. 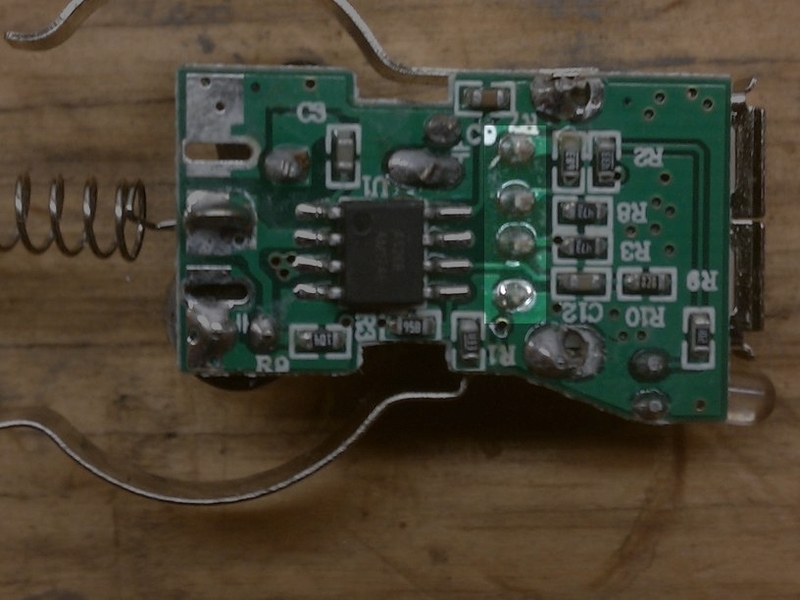 You can see the 4 unmolested pins of the USB connector in the center of the board. The center 2 pins have now been bridged with solder and capable devices will now charge at a faster, higher current rate. There has been some question as to which, if any, Apple products this will work with and at what rate. Apple uses, or has used, a slight variation that communicates a more specific current rating to the device by using pull-down resistors on each data pin. Based on what I’ve read this should only apply to older (pre-2007) products that were made before the USB standard introduced dedicated charging ports. I would think that things manufactured after that point would have to conform to the standard.